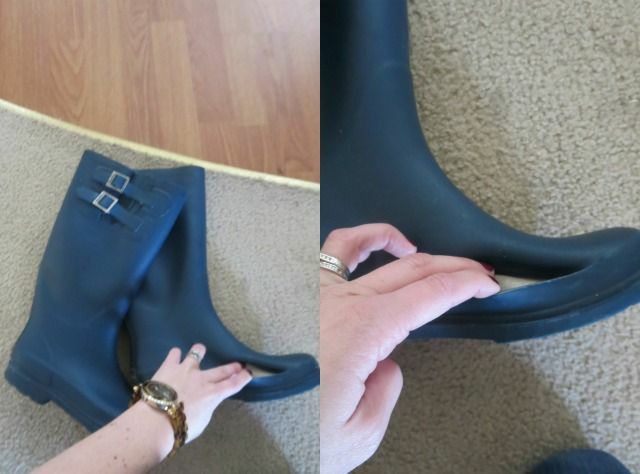 Time for New Rain Boots! I had bought myself the below blue rain boots three years ago and they have been my go-to's in rain and snow ever since. To my surprise I went to put them on and my feet felt wet. This was a sad day as I have no other rain/snow type boots. In the meantime I have been ruining my UGGS by wearing them in the snow and salt. Time was running out as more and more snow is falling daily so I had to make a decision. What kind of new rain boots do I want? After looking online at all the sales for Christmas, I realized it was time for an upgrade. 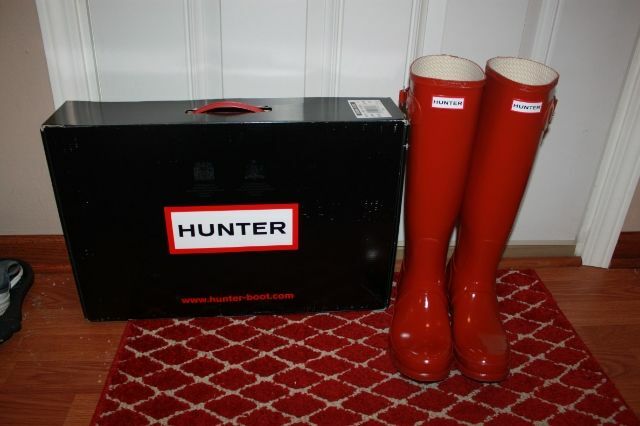 I have always wanted Hunter Boots and with 30% off I decided to use that and a few gift cards and get myself a pair. I think I paid $60 out of pocket when all was said and done. SCORE! I was between red, rust, and teal but am very pleased I went with the rust colored ones. They are the perfect color orange and will work year round for rain and snowy weather. Tis the season to find great deals! I own already my second pair of Hunter boots, as I managed it to get a hole in my first pair as I have worn them so often :) Wish you many fun with Hunters! Awwww I know it's incredibly sad to find a large hole in a pair of favorite boots, but happy you found a pair of GORGEOUS replacement. what a score!! i wanted hunters forever, but couldn't get myself to dish out the money on something i'd rarely wear here...so when i saw them on gilt for $90 one year, i jumped on it. i really wanted red, but they didn't have it. guess beggars can't be choosy, lol! congrats! great color! oh no, these get holes too?! They seem so sturdy and thick! is it bad I've never heard of Hunter boots? dowsers, the red! gotta get me some!